Formed in Sheffield, Def Leppard have been hailed as the UK’s greatest-ever arena rock band. They have sold over 100 million albums worldwide in a career that spans three decades and have a highly anticipated new self-titled studio album coming in late 2015. Def Leppard’s influential career includes countless hit singles and ground-breaking multi-platinum albums – including two of the best-selling records of all time, “Pyromania” and “Hysteria”, both of which have been given the elusive Diamond Award. These two albums alone contain 10 hit singles including the classic Leppard tracks “Rock of Ages,” “Animal,” “Pour Some Sugar On Me” and “Foolin’.” Def Leppard – Joe Elliott (vocals), Vivian Campbell (guitar), Phil Collen (guitar), Rick “Sav” Savage (bass) and Rick Allen (drums) – continue to be one of the most important forces in rock music. The group’s spectacular live shows, filled with powerful melodic rock anthems, continue to sell out venues worldwide. 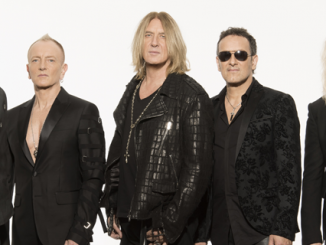 Def Leppard’s epic live shows and arsenal of hits have become synonymous with their name, leading the Rock Legends to be heralded as an institution in both the music and touring industry. “Ohh, have you got trouble…Brother Joe & The Lepps?…DC & The Snakes?… Them Black Star Riders?…On the same night?? ?…I can’t wait! !…SEE YOU THERE!! !” said Whitesnake’s David Coverdale on the forthcoming tour. Co-headlining the tour are the legendary Whitesnake who carry a rightful & righteous reputation as one of the world’s leading rock’n’roll bands. Founded by former Deep Purple singer David Coverdale, the band have earned multi-platinum albums and multiple top 10 hits worldwide, including 2 number 1 singles with “Here I Go Again” and “Is This Love” as well as the unforgettable hammer of “Still Of The Night”. Bombast, bravado, talent and passion have helped establish Whitesnake as the perennial platinum favourite they have become and they’re back with a vengeance in 2015. The world-renowned group featuring David Coverdale (vocals), Reb Beach (guitar), Joel Hoekstra (guitar), Michael Devin (bass) and Tommy Aldridge (drums), will release their 12th studio record “The Purple Album”, a tribute to the band and to the music Coverdale wrote and recorded with Deep Purple Mark 3 & 4, followed by a world tour, culminating with the co-headline UK dates.